The Office of Legislative Affairs and Policy Communications welcomes you to this repository of information and assistance on legislation and policy development activities for the Federal Highway Administration within the U.S. Department of Transportation. "Funding Federal-Aid Highways" provides an introductory tutorial to the federal-aid highway program structure and implementation practices. 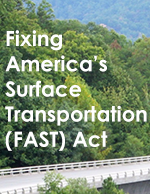 This website provides information about the Fixing America's Surface Transportation (FAST) Act (P.L. 114-94), which was signed into law on December 4, 2015.